Alleged comments by Syrian Grand Mufti Ahmad Badreddine Hassoun last week over the fate of two Orthodox bishops abducted in the troubled Middle East country earlier this year have raised hopes that the two clerics are still alive, Kathimerini understands. According to Russian media, during a visit to Moscow on Tuesday, Hassoun said he had information that Greek Orthodox Archbishop Paul Yazigi and Syriac Orthodox Archbishop Yohanna Ibrahim are alive and that they are in Turkey. The Turkish Foreign Ministry subsequently denied the allegations. 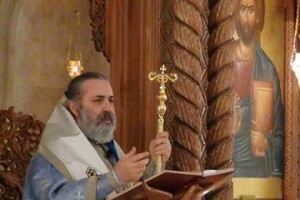 Bishop Louka, the representative of Patriarch John X of Antioch, told Kathimerini the patriarchate was aware of the comments but did not have any firsthand information about their whereabouts. “We hear all sorts of things, but all we can do right now is pray for them,” he said. The two clerics were seized in April near the northern commercial and industrial hub of Aleppo, which was contested by rebels and forces loyal to President Bashar al-Assad. Authorities suggested the abduction had been carried out by anti-Assad rebels. Optimism about their fate was also reinforced by comments made by Lebanese intelligence chief Abbas Ibrahim, who on Tuesday said that he knew the whereabouts of the two bishops, adding that he had been negotiating for their release.